Paul Talalay's research showed why broccoli is good for us. Now, a new center at Johns Hopkins is looking for more foods that could stave off cancer and other diseases. It's morning in the office beside Paul Talalay's lab. As the coffee brews and his staff mills in with questions and out with answers, the man who turned acrid, dark-green crowns that resemble brains gone horribly wrong into something desirable explains the major misgiving surrounding an illustrious, six-decade-long career in research. "My greatest fear is that on my tombstone, they'll say, 'He made broccoli famous,'" he says. Well, for all of his accomplishments — building a PhD pharmacology program at the Johns Hopkins School of Medicine, hiring and training some of the nation's foremost biomedical researchers, appearing in movies made by Baltimore film flake John Waters — Talalay will have to forgive observers who won't let him live down a little thing like isolating a compound in broccoli that greatly increases the body's ability to ward off cancer. Talalay directs the Laboratory for Molecular Pharmacology at Johns Hopkins, which in 1992 discovered the health-promoting properties of sulforaphane glucosinolate, the cancer-fighting chemical abundant in the pungent Brassica family of vegetables. The lab's findings were splashed on the front page of The New York Times and hailed as one of the top 100 scientific discoveries of the 20th century by Popular Mechanics. All of which fortified a still-growing movement built, by science and so-called foodies, on the idea that people can improve their health by eating the right foods. Talalay's research also might have had an effect on the marketplace: Sales of broccoli have doubled in the United States since the discovery of sulforaphane's powers of prevention. 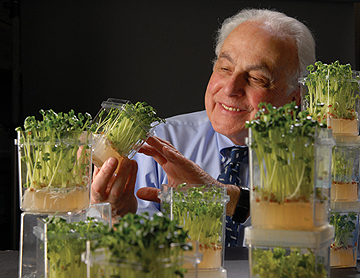 Talalay — along with his son, Antony, and Johns Hopkins plant physiology researcher Jed Fahey, A&S '75 — formed Brassica Products, which now produces and sells two million four-ounce packages of broccoli sprouts a year nationwide. (Hopkins receives a licensing fee from the company for each batch sold.) 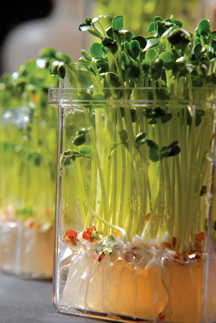 The sprouts, which pack 20 to 50 times the cancer-fighting punch of the mature broccoli plant, are — like the latter half of Talalay's research career — designed to help people help themselves fight disease. He has dubbed his lab's work and that of others like it "chemoprotection." "'Protection' implies an empowering function that an individual can use," he says. "From this idea has come a principle that one can use the body's own protective mechanisms and boost them. That's the principle that animates us." "Cancer was not a preventable disease in their eyes," Talalay says. People either "came down" with the disease or they didn't. And he'll tell all of these stories in an accent mostly made up of soft British consonants and languorous vowels that can turn words and phrases into dramas, bons mots, or mere lessons in enunciation: Prod-yoose, for example, is what one buys in the fresh vegetable aisle. A stalwart member of a cohort of experimental generalists who saw the entire world as ripe for scientific inquiry — as opposed to the more-blindered lab specialists of today — Talalay's been nothing but daring. "He's never been afraid to tackle new areas of research," says Fahey. The two first met when Fahey was an undergraduate in a controversial class Talalay was teaching about the effects of recreational drug use on the mind and body. Since joining the Laboratory for Molecular Sciences in 1993, Fahey has become more accustomed to Talalay the taskmaster. "He's a ceaseless micro-manager," Fahey says. "He comes from a school of training that says you can't trust anyone's results, that you have to do the protocols yourself. When you see an 85-year-old man who has accomplished all he has and who has all this energy, you can't help but be drawn to him." These days, most of the stories Talalay unfolds involve 30 years of chemoprotection research — a hunt for the substances, mostly from plants, that can boost the human body's ability to stave off disease — and how they dovetail with a new laboratory and center that will be built to expand the search. Currently dubbed the Chemoprotection Center (its final moniker likely will carry the name of a benefactor or two), the lab will be dedicated this month as part of the new Science and Technology Park at the medical campus. Talalay hopes it will create a flurry of new discoveries of foodborne substances that can aid people suffering from any of a wide number of conditions beyond cancers, including Alzheimer's disease and cardiac problems. "Ultimately, I don't think sulforaphane is all that important in and of itself," Talalay says. "Maybe it is, but it's the principle that it allowed us to recognize, the tool that it provides for all these subsequent studies." That tool was hard won, Talalay says, and represents a high point in a career that has often run contrary to the prevailing medical wisdom. Talalay's life in medicine began not long after he came with his family to the United States from England at age 17 to study biology at the Massachusetts Institute of Technology. German U-boats roamed the Atlantic during his 10-day journey to New York in 1940. The trip, which he describes as harrowing, reflected the tumult of his childhood in a Russian-Jewish family in Europe. When Talalay was 10, his family left Germany immediately after Adolf Hitler came to power; they fled to England, where he picked up a love for scholarship, along with his signature accent. Early on, he decided his career would be based on two research variables: cancer and enzymes. Love of the latter evinced itself during an MIT course that taught him the details of how enzymes convert substances into chemicals the human body needs to function. "I still proudly consider myself an enzymologist," he says. Cancer became an area of intense interest after he graduated from MIT and worked at the University of Chicago with Charles Huggins, who would later win a Nobel Prize in physiology or medicine for the hormonal treatments he developed for prostate cancer. Talalay says he was "profoundly moved" by instances of remission in patients, once thought to be terminally ill, whose lives were saved by Huggins' techniques. During the 1940s, cancer had an air of invincibility about it; Huggins' research countered that idea, and Talalay had found a cause to which he could devote his life. He earned his medical degree at Yale University, then headed back to Chicago, working once again alongside Huggins. In 1963, Talalay came to Johns Hopkins to head up the Department of Pharmacology and Experimental Therapeutics and to research anti-tumor agents. His tenure as chair of the department was legendary, according to colleagues at Hopkins and elsewhere. He started the PhD program in pharmacology, breaking the tradition nurtured by his two predecessors who believed that a medical degree was all one needed to perform research in the field. Paul Talalay: "We will have the evidence of how to prolong life through diet." Talalay began drawing some of the country's top biomedical researchers to Baltimore. Among them are Donald Coffey, director of research at Hopkins' James Buchanan Brady Urological Institute; and Solomon H. Snyder, a Hopkins professor of psychiatry, neurosciences, and pharmacology and discoverer of opiate receptors in the brain. Snyder at the time was a very promising medical student who was applying for a job as a psychiatric resident at the National Institutes of Health. 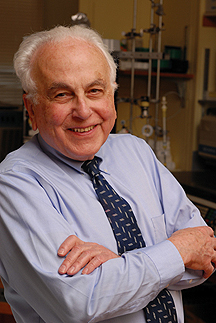 Talalay wooed him to Hopkins in the 1960s by making him both a resident and an assistant professor in pharmacology at the School of Medicine. Says Snyder, "It paid about 50 times more than just being a resident, which is the job I had been looking for. He made sure I was set up with a lab assistant and equipment." As Snyder's career blossomed, Talalay also made sure that he remained in Baltimore, twice accelerating the promotions process so the younger researcher could climb the Hopkins academic ladder more quickly. "He's really taken good care of the people he brought in. Not only was he a boss, but he tried to be a good friend as well," says Snyder, adding that several years ago, when he had to be rushed to the hospital with abdominal pains, it was Talalay who drove him. As Talalay trained new scientists and nurtured the work of those he hired, he burnished his own reputation as a researcher, to the point that he has become recognized around the world. "He's drop-dead smart, a member of the National Academy of Sciences, and absolutely at the top of the top of international biomedical researchers," says Michael Sporn, a professor of pharmacology and toxicology at the Dartmouth Medical School. Sporn, like Talalay, searches for cancer-preventing substances. "He sticks with a problem like a dog on a bone until it's done. His career provides an excellent role model for anyone who wants to work in research science." But Talalay's choice of research subject has occasionally thrown his colleagues for a loop. Though more than 10 million new cases of cancer are diagnosed each year, the medical world hasn't always seen value in prevention. And Talalay's stature temporarily lost some of its glimmer in the early 1970s, when he decided to take a leap of faith away from treatment and toward preventing cancer. He resigned as head of Hopkins pharmacology in 1973, then completely reshaped his lab's strategy to develop ways to reduce cancer risk. His colleagues thought he was crazy. "Cancer was not a preventable disease in their eyes," Talalay says. People either "came down" with the disease, or they didn't. In the early days of chemoprotection research, funding opportunities were close to nil, and cancer prevention conferences were barely attended. "Back then, it was difficult to find a room small enough to accommodate the number of people who would listen to someone who talked about ways to prevent cancer," Talalay says. In fact, he would argue that reducing cancer through prevention isn't an option — it's a necessity. In 20 to 25 years, the cancer caseload in the United States will double. As many as two-thirds of those cancers will develop because of the way people eat or the bad habits they maintain. "Even though treatment options have to be pursued with great vigor, they will have no effect on lowering the incidence of new cancer cases," Talalay says. These days, it's hard to imagine anyone arguing with him. The dietary supplements business — comprised of pills and potions made of vitamins, minerals, and herbs that may do little to improve health — has boomed from a $12 billion national industry in 1997 to a $22 billion one a decade later. A veritable forest of fiber has been spent to manufacture books telling us what makes food good (including In Defense of Food, by Michael Pollan, and What to Eat, by Marion Nestle) or what can turn it lethal (Fast Food Nation, by Eric Schlosser). Americans' fascination with the healing — or health-threatening — properties of what they eat has become, shall we say, all-consuming. Still, skepticism lingers in the medical world, says Sporn. "People who are doing clinical cancer work aren't enamored of prevention," he says. "There's no romance in it. There's no one on death's door whose life is saved through prevention. The American public is way ahead of medicine on this." Despite the misgivings of many medical professionals, Talalay persevered throughout the 1980s and 1990s, moving toward examining the web of protective proteins in each human cell. After theorizing that people who reported regularly eating fruits and vegetables might be benefiting from substances in plants, he devised experiments to see whether such compounds could guard cells against the four horsemen of the anatomical apocalypse — inflammation, oxidation, DNA-damaging chemicals, and radiation. "I cannot say with certainty that we had a clear vision of where we were going," he says. "But we had started with the notion that we could block carcinogenesis if we could isolate these substances." Talalay recommends that people eat a wide variety of foods to get the maximum disease-fighting bang from their grocery bucks. Plants seemed to be a natural subject for such research. As they've evolved, plants have developed thousands of chemicals that act as pesticides or protection against infection. Humans eat as many as 10,000 of these compounds when they chomp on vegetables. Talalay's lab decided to find out which vegetables could offer the highest amounts of a handful of those substances. The researchers initially focused on glucosinolates, substances that are particularly abundant in cruciferous vegetables and are turned by enzymes and intestinal bacteria into isothiocyanates, chemicals that block the development of cancer cells. The lab had a breakthrough in 1991. Talalay had sent a postdoc with a $20 bill in his fist to the Northeast Market green grocer. The investigator returned with more than a dozen vegetables, which he and Talalay tested for certain compounds. They found that broccoli and some other prospective side dishes were particularly high in sulforaphane, and that the substance could "upregulate" — or boost — the functions of human proteins that neutralize the processes of disease. Typically, such enzymes work at about 40 percent of their disease-preventing capacity. Sulforaphane kicks them up a notch. Experiments with rats confirmed the function of those protective proteins and sulforaphane's ability to make them stronger. Despite the initial skepticism the paper engendered, the findings of Talalay et al. touched off a mini-explosion of research into the disease-fighting power of sulforaphane. The number of published studies involving the substance jumped from a handful in 1990 to 155 in 2006. Some experiments have shown that sulforaphane may lengthen the life of worms. Generally, studies on animals have shown that only one dietary method — severely restricting calories — can aid longevity. Long-term human studies, meanwhile, have proved less than useful. They rely on people to report what foods they have eaten and how much, and those reports can be inaccurate. Because there is no way to control or account for the effects of possible interactions of food with environmental factors, exercise, and the like, isolating the compounds and their effects on health is nearly impossible. So, Talalay takes some satisfaction in the worm findings. "Am I doing handstands over them?" he says. "No, but I do believe in the science." However, some researchers have doubts that isolated nutrients are the key to good health. While everything from curry and garlic to lingonberries and fish oil has been touted as a dietary elixir, individual vitamins and nutrients can have more than merely positive effects on health. For example, in one oft-cited study, vitamin A — regarded as a potent antioxidant — was found to increase the risk of lung cancer among smokers. Folic acid is added to everything from vitamin supplements to baked goods to prevent thousands of neurological birth defects, but some scientists are skeptical of its value because of early indications that the chemical promotes the growth of cells, including cancerous ones in the colon. Also, the effects of single anti-carcinogenic chemicals can't be understood when studied alone. "It's hard to isolate the effects of single components of food out of context," says Nestle, professor of nutrition at New York University. She argues that the human diet is much more complex than that of lab rats, and that beyond the usual bromides — don't smoke, get exercise, eat fruits and vegetables — not much is certain regarding the development of cancer and other diseases. "These are excellent researchers, and many investigators believe that lines of research using chemoprotective factors will yield benefits," Nestle says. "It would be great if some component in broccoli turned out to be a miracle drug, and this group has enough preliminary evidence to argue that sulforaphane might be one such miracle factor. But the history of nutrition research does not provide much cause for optimism." As he brews another (rich-in-antioxidants) cup of coffee late in the afternoon, Talalay admits to some tiredness. "I have to be a little economical about my time," he says, his movements a tad slower than in the a.m. He's heard the nightmare tales of colleagues in Europe who, because of national laws, have been forced into retirement at 65 or 70. "My greatest anxiety is that, one day, I'll learn how to play golf and end up in Florida. That's the flip answer," he says. "The one that is closer to the truth is, I've never found anything that gives me the high I get from making a scientific discovery, or of explaining that process to younger people." Talalay hopes he can reach greater heights while working in the new center. Designed as a multidisciplinary font of inquiry, the Chemoprotection Center will involve researchers and staff from the Krieger School, the School of Medicine, and the Bloomberg School of Public Health, and will tap clinical departments at the Johns Hopkins Hospital for help delivering information on patients and devising experiments. His lab is slated to be ready by the end of fall. "The idea is to break down the boundaries between conventional lines of thinking to get at the discoveries that lurk in the borderlands between disciplines," Talalay says. Nutritionists will investigate alongside molecular biologists and pharmacologists in search of possible applications for their findings. In the basement, plant physiologists will cultivate plants and isolate and purify compounds from them to be tested, on the five floors above, on animals and, eventually, humans. Already, Jed Fahey and colleagues are looking into the preventive properties found in substances such as honey and the moringa, an entirely edible tree found in equatorial regions that could become a major boon to undernourished people in developing countries. Talalay plans to set up animal studies to approximate human degenerative, inflammatory, and malignant diseases. The center's staff will then test plant-based substances on them before devising clinical trials. "Most organizations are disease-specific in their mission," he says. "We have a mission here that involves looking at chronic diseases more generally, more broadly. What we're thinking is that over a wide range of diseases there are common stressors on the body. If that's true, we might find some common answers." Like Nestle, Talalay pooh-poohs the notion that isolating one type of compound out of thousands will provide all of the disease-dispatching benefits humans can derive from food. As science continues to study disease-fighting substances in plants, he recommends that people eat a wide variety of foods, including fruits and vegetables, to get the maximum disease-fighting bang from their grocery bucks. Talalay rails against supplements, including daily vitamins. "There's no doubt in my mind that it's ridiculous to think that one pill could do what a varied diet could do," he says. "The vast majority of studies don't show any benefit to taking them." But it's just as absurd to write off chemoprotection research as inadequate, he adds, especially in the long term. "We will have the evidence of how to prolong life through diet. The studies will come along," he says. And with hard work and its usual residue — luck — Talalay will have his name on them. "It's an exciting time and a new exciting idea. I think this institution needs this [center] now," he says, his face lighting up. He adds with a wry smile: "I just don't want to die before the damn thing opens." Michael Anft is a Johns Hopkins Magazine senior writer.